Glamorous model Alison Parker (Cristina Raines) is in love with her rich, handsome boyfriend Michael (Chris Sarandon) but isn’t quite ready for the commitment of living with or marrying him. So she does what any sensible girl would do: continue dating him, but find an apartment of her own. With the help of realtor Miss Logan (Ava Gardner), Alison tracks down a beautiful apartment in a quiet, old building. There’s a somewhat creepy blind priest occupying the top floor, but the realtor promises that he’s completely harmless. There are waterfront views to make up for the upstairs neighbor. It seems to be exactly what Alison is looking for, and Miss Logan gives her a price that she just can’t pass up. But when Alison moves into the apartment, she gets a surprise. Not only are there more neighbors lurking around than she realized, but they’re all very strange neighbors. And to top that off, she starts having equally strange physical reactions while staying in the apartment. 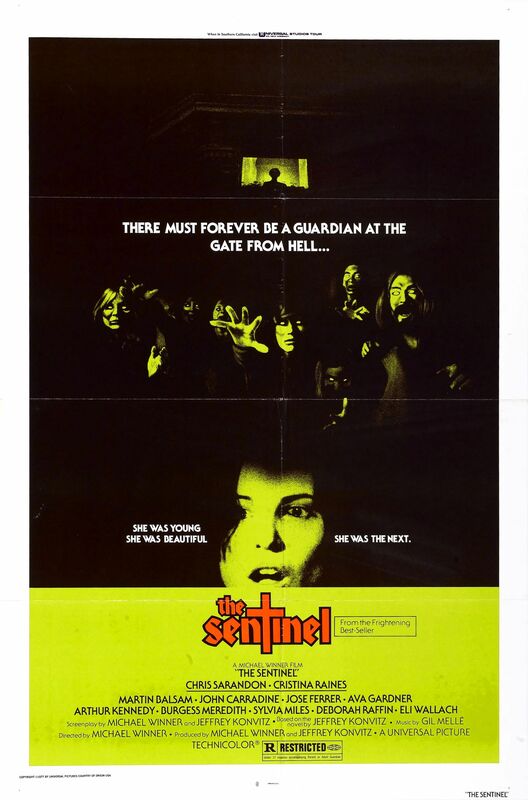 Michael Winner directs the 1977 paranormal/religious horror The Sentinel. It was adapted for the screen by Jeffrey Konvitz from his own novel. Also appearing in the film are John Carradine, Jose Ferrer, Eli Wallach, Christopher Walken, Beverly D’Angelo and a slew of other well-known performers. The Sentinel is not the type of horror that is immediately thrilling and hooks you from the first shot. It takes a few minutes to get going and is peppered with odd moments once it picks up. While it follows some of the horror genre’s conventions – a pretty girl antagonized, moving into a new home to find that it’s haunted, the use of kooky side characters, etc. – it isn’t really your typical horror. It seems to aim for confusing the viewer rather than providing outright scares. The “scary” moments can even be a bit humorous at times, which seems to be a bit of a commonality among most 1970s and 1980s films of the genre. This is especially true in the beginning, when the performances are quite stiff. There are a huge amount of painfully awkward scenes here, from a drunken dance party of elderly neighbors to just about every action made by Beverly D’Angelo’s character. The story attempts to become deeply woven and twisty, but thanks to these hilariously awkward moments and the quality of the performances, it’s hard to buy into. The twists can be interesting, particularly near the end, but they don’t quite succeed in what the filmmakers seem to have been aiming for. Still, the “odd moment here and there, no big frights” tactic does work well in some ways. It certainly builds a lot of suspense, because the viewer is left a bit bum-fuzzled by most of the little twists and is then left hanging completely for a while. The Sentinel gets scarier (and gorier – sometimes a bit too gory for my taste) as it progresses, elevating the viewer’s already-growing tension level. The score helps as well. It has a style very distinct to the period in which the film was made and sets the mood in scenes that otherwise may have felt flat. I remember seeing this on TV as a kid and it completely freaked me out. I don’t think I slept for a week!